The No. 8 University of Florida gymnastics team (1-1, 1-0 SEC) opened the 2010 home season with a 196.575-195.925 dual meet win versus No. 7 Arkansas (1-1, 0-1 SEC) Friday evening in front of a Stephen C. O’Connell Center crowd of 4,715. 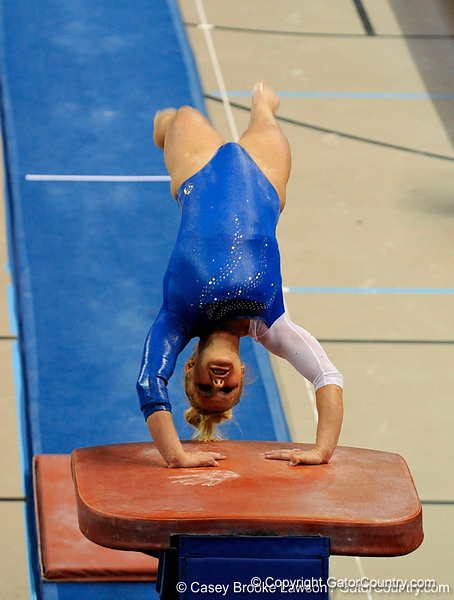 It was sure to be a tight competition, as the two teams both advanced to the 2009 NCAA Gymnastics Super Six team final, with Florida taking fourth and Arkansas placing fifth. Florida never trailed, but owned a lead of 0.350 heading into the final rotation – a margin that could be surpassed if the Gators encountered problems on the floor exercise. A miss by Florida’s third performer put the focus firmly on the final three, as strong routines would certainly be needed to claim the win. The final trio, consisting of Marissa King, Maranda Smith and Ashanée Dickerson, all turned in hits to finish out the Gator win. Dickerson claimed the evening’s all-around title, becoming the first Gator freshman since former All-American Corey Hartung in 2006 to claim the win in the first two all-around performances of their collegiate careers. Last week, she turned in the nation’s second-highest all-around total (39.35) of this very young season. Tonight she raised that total to 39.475. Dickerson upped her collegiate best to 9.925 on vault to take her second consecutive title on that event. She anchored the Gators’ floor exercise lineup with a collegiate-best 9.90 to share the title with Arkansas’ Jaime Pisani. Senior All-American Maranda Smith collected the first uneven bars win of her collegiate career with her season-best mark of 9.875. Junior All-American Alicia Goodwin and UA’s Amy DeFilippo tied for second with bar marks of 9.85. Florida was led on balance beam by freshman Liz Green’s runner-up mark of 9.85. It was Green’s first appearance in the Gator beam lineup, as she performed an exhibition routine last week in the season opener at Oklahoma. A trio of Gators shared third on beam at 9.825 – senior Rebekah Zaiser, plus freshmen Dickerson and Randy Stageberg. Sophomore Amy Ferguson shared third in the floor standings with UA’s Casey Jo Magee, as each turned in season-high marks of 9.85. The evening’s balance beam title went to Arkansas’ Casey Jo Magee at 9.90. Next week, Florida travels to Kentucky for a Jan. 22 dual meet.